Large apartment with views and direct access to the sea, 20 km away from Palma. 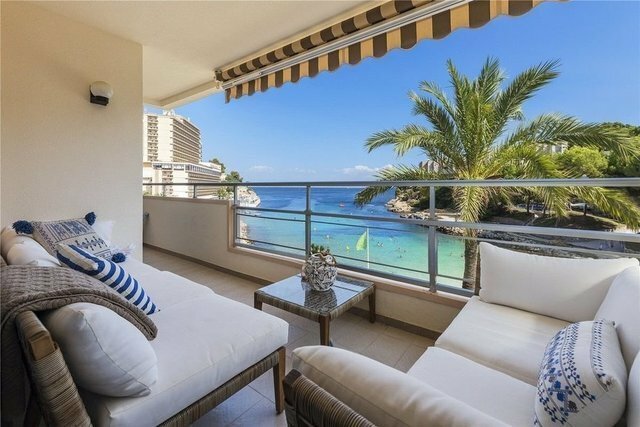 Excellent apartment in a privileged location, on the enchanting beach of Cala Vinyas. This property has a magnificent view over the sea, the coast and the communal garden. The residential complex is very well maintained and is located on the seafront with direct access. The community has two swimming pools: one large for adults and another smaller one for children as well as a clay tennis court. This apartment was completely renovated and has been tastefully decorated. It has five bedrooms, one of which is the master suite with private terrace and wonderful views over the sea. The apartment has an open plan kitchen that connects to the living room with access to the terrace - one of the most inviting areas of the property. It is an ideal apartment to enjoy vacations with family and friends or to live all year round on sunny Mallorca. Other features worth highlighting: air conditioning hot / cold. Elevator and parking. Cala Vinyes is seven kilometers from Calvià, between Cap des Falco and Magaluf. Residential holiday homes and other services for leisure are landmarks of this predominantly sandy coast. A sea inlet finishes on two beaches with fine, golden sand. A short walk connects both parts of Cala Vinyes.